Do you want to make it easy for site visitors to subscribe to your email list? Asking people to join your newsletter while they’re filling out your contact form is a great way to get more subscribers. In this article, we’ll show you how to add a Constant Contact checkbox to your contact form. For help with this, check out our tutorial on how to create a simple contact form in WordPress. 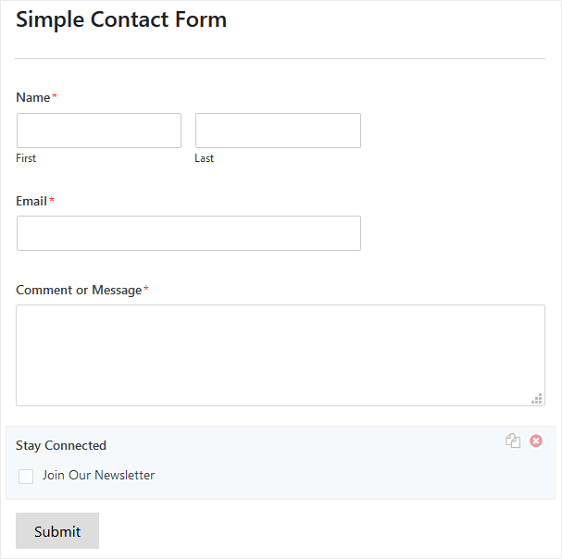 When you create your contact form, you’ll need to add a checkbox to it for your site visitors to select when they want to join your Constant Contact email list. Keep in mind this checkbox is just that, a checkbox. If you want people to be able to subscribe to your email list, you’ll need to connect it to your Constant Contact account. Then people will be added to your email list when they click the checkbox and submit the form. 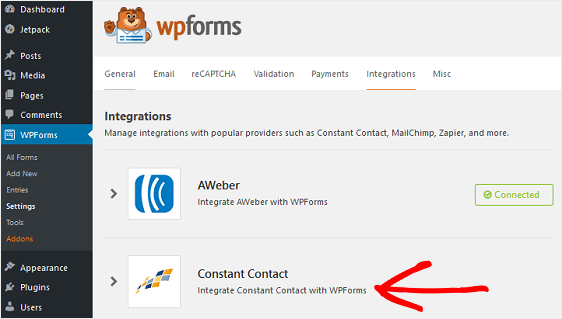 WPForms integrates with Constant Contact to make growing your email list easy to do. In fact, this integration gives you the power to let site visitors subscribe to your email list no matter which type of form you create, and doesn’t require an additional addon. 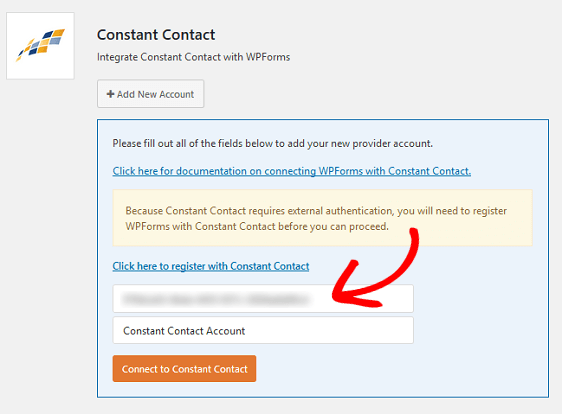 That said, you’ll still need to connect WPForms to Constant Contact so that when someone subscribes to your newsletter, they’re automatically added to your email list. To start, go to WPForms » Settings. 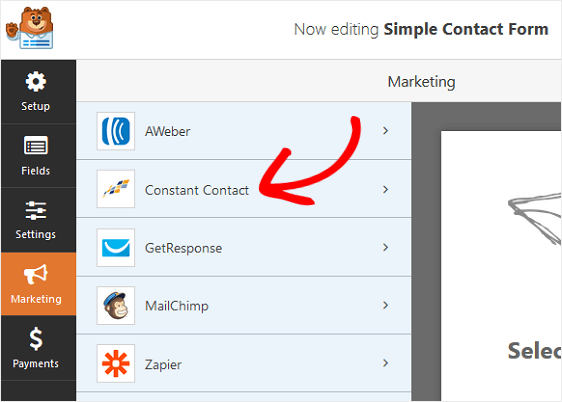 Click on the Integrations tab and then on the Constant Contact integration. Next, you’ll need to add your Constant Contact account. So, click on Add New Account. 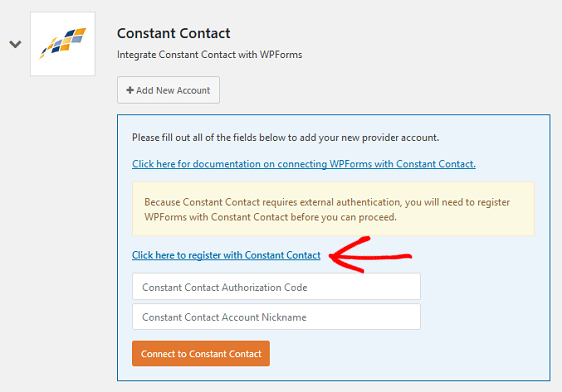 Click on the link labeled “Click here to register with Constant Contact” so you can connect Constant Contact to WPForms. 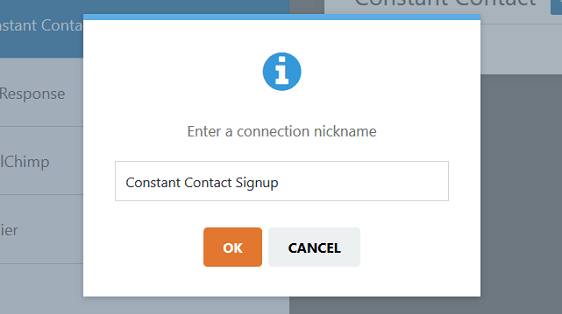 You’ll see a popup that will prompt you to sign into your Constant Contact account. 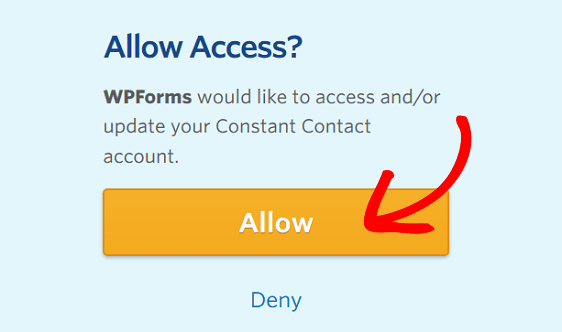 After you sign in, you’ll see another screen asking you to allow WPForms to access your Constant Contact account. You’ll then see your Constant Contact Authorization code. Copy it and add it into the field in your WordPress dashboard. In addition, give your account a nickname if you want. Click Connect to Constant Contact. You’ll see a Connected symbol if everything was connected the right way. If at any time you want to add another account or disconnect the current one, you can do that here. 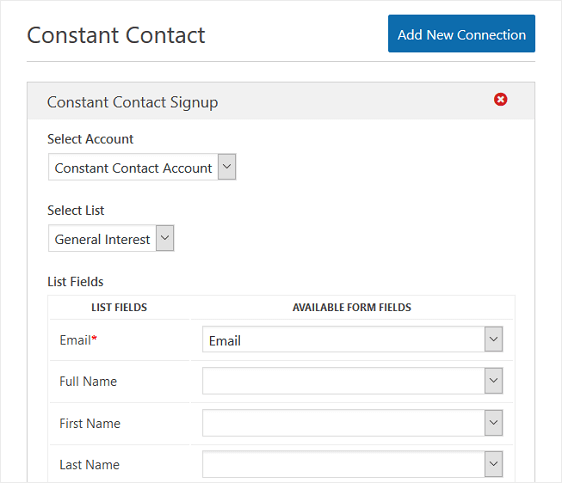 Now you’ll need to connect Constant Contact to your contact form. To do this, go to your newly created form and click on the Marketing tab in the Form Editor. A popup will appear asking you to nickname your connection. This is for your reference only, so you can call it whatever you want. 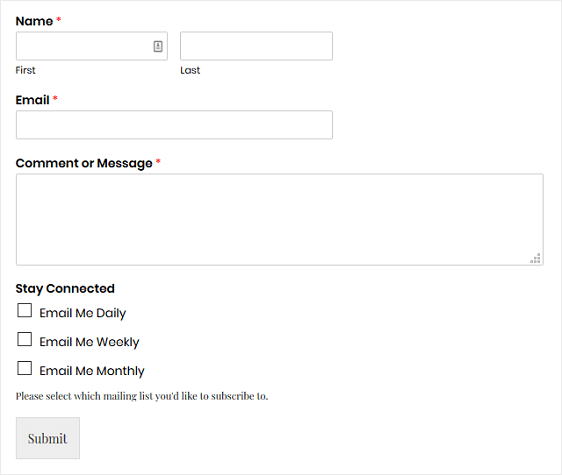 This feature is helpful if you plan to connect this form to more than one mailing list. If you want, you can enable conditional logic on your contact form. This is especially helpful if you want people to choose which mailing list they want to be added to when they subscribe. For example, you might have a daily or weekly newsletter. Or, you might have informational newsletters, promotional newsletters, and special events newsletters that people want to subscribe to. To do this, you’ll first have to create additional mailing lists in Constant Contact. Log into your Constant Contact account and go to Contacts » Email Lists » Enter a New List. Here you can name your new email lists. Now, you’ll need to add additional checkboxes to your contact form so your site visitors have a choice when they subscribe to your email list. You can also add a description to your checkbox section letting customers know what they need to do. Next, go to the Marketing tab in the Form Editor. Under Constant Contact select the Enable conditional logic checkbox. 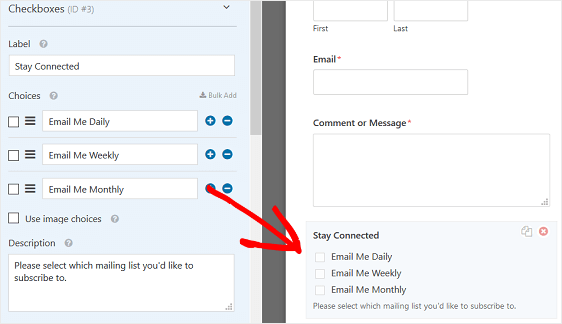 In order for people to be added to the email list they choose when subscribing, you’ll need to add new connections and enable conditional logic for all checkboxes you have available. Now you’re ready to add your contact form, complete with a Constant Contact signup checkbox, to your WordPress website. WPForms lets you add your forms to multiple places on your website. For example, you can add your contact form in your WordPress post or page content, in the footer section of your site, and even in the sidebar widget areas. And there you have it! You now know how to add a Constant Contact checkbox to your contact forms to encourage more people to subscribe to your email list. If you want to protect your forms from spam, consider checking out how to add reCAPTCHA to your WordPress forms. And, if you want to avoid adding reCAPTCHA, but still want to prevent spam submissions, check out this helpful guide on building a spam-free contact form without CAPTCHA.